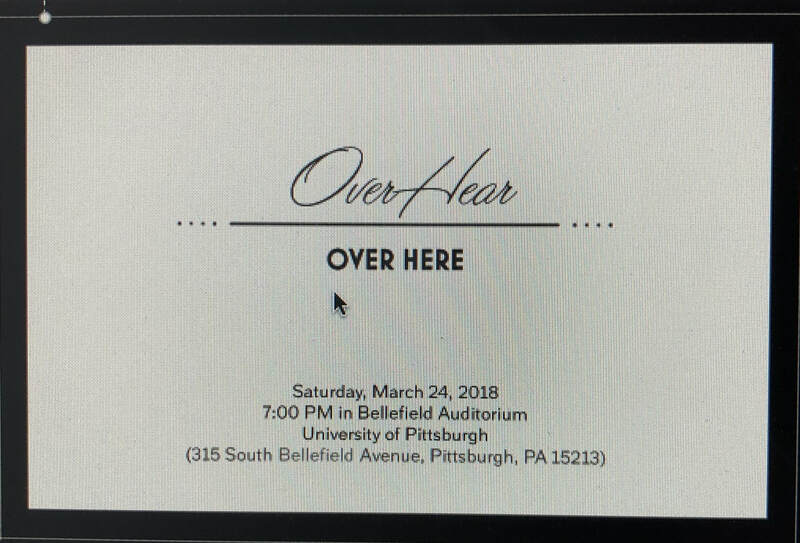 The annual concert showcasing works by University of Pittsburgh students in music composition. Come and hear music by the city’s top young talent. Various locations throughout the neighborhoods of the greater Pittsburgh area. OverHear is a series of pop-up musical workplace interruptions. Musicians appear in places where people work, where they may overhear our music as they continue their jobs. OverHear brings live music and instruments to places where music normally isn’t. It is not a concert but an insinuation of music into rooms where work is occurring. IonSound Project also spontaneously crops up in places where there is a void of live music and where performances seem impossible to hold. Some music and composers you may have heard on our pop up concerts, and more! IonSound Project comprises flutist Peggy Yoo, clarinetist Kathleen Costello, violinist Laura Motchalov, cellist Elisa Kohanski, and pianists Rob Frankenberry and Jack Kurutz. IonSound seeks to add to Pittsburgh's cultural life by programming innovative concerts, commissioning works of new music, collaborating with artists in a variety of disciplines, and exploring the boundaries between concert and popular music. The members represent some of the most in-demand young musicians in the Pittsburgh area. Collectively, they perform with such ensembles as the Pittsburgh Symphony, Alabama Symphony, Pittsburgh Opera, Pittsburgh Ballet Theater, Wheeling Symphony, Erie Philharmonic, and have also appeared with the Pittsburgh Philharmonic, Columbus Symphony, Charleston Symphony, Akron Symphony, and the Buffalo Philharmonic. Since giving its first concert in 2004, the ensemble has presented more than 80 works by 20th and 21st century composers, demonstrating an ongoing dedication to promoting the work of established and emerging composers from the Pittsburgh region as well as from across the country. 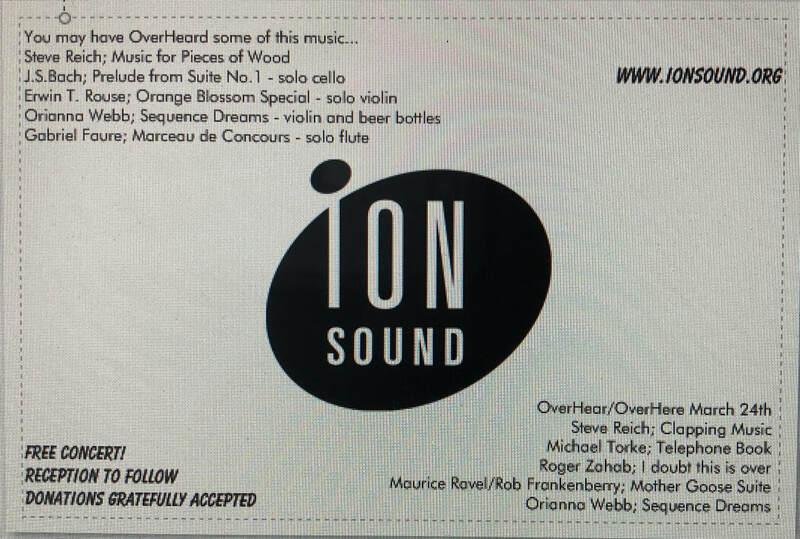 In 2006, IonSound Project expanded its activities to include workshop readings and performances of works by University of Pittsburgh composition students, which led to an official appointment in 2008 as Ensemble-in-Residence of the music department. This is the first appointment of its kind in the history of the University. Engaging and experimental collaborations with artists in other disciplines is an essential part of IonSound Project's programming and performance. Collaborators have included poet Barbara Edelmann, actor Benjamin Greenstone, filmmaker Chris Ivey, dancers from Attack Theater and KNOTDance, photographer Charles Biddle, environmental artists Lauren Braun and Amy Rappa, and singer/songwriters Heather Kropf and Mark Dignam. For the 2012-2013 season, IonSound was awarded a Spark grant from the Sprout Foundation of Pittsburgh. IonSound collaborated with Pittsburgh roboticists and composers to present a series of concerts and educational workshops focused on the creation of motorized musical instruments. Featured in the concerts were Jeremy Boyle's robot drum set and Garth Zeglin's kinetic fabric sculpture, as well as student-created robotic instruments. Praised by the Pittsburgh Post-Gazette for “exemplary taste” in programming and for playing that “generates sparks,” IonSound has sought to include a commissioned work or premiere on almost every program; including premieres of works by Roger Zahab, Philip Thompson, Jeremy Beck, Jonathan Kolm, Daniel Perttu, Nizan Leibovich, and Jed Distler. IonSound has also arranged and premiered new orchestrations of Satie's Three Pieces in the Shape of a Pear, Mahler's Kindertotenlieder, and Ravel's Mother Goose Suite. During the summer of 2009, IonSound Project was presented by the Parks and Recreation Department of the City of Pittsburgh as part of their Bach, Beethoven, and Brunch series in Mellon Park. October 2009 saw the group's New York debut presented by the Phoenix Concerts at the Church of St. Matthew and St. Timothy. In other news, IonSound Project’s latest recording project is out on CD! Separate Self features compositions by Pittsburgh composer Phil Thompson, with all works inspired by or collaborations with different mediums in the visual arts. Tracks are also available on iTunes, Spotify, Amazon, and GooglePlay.